A stock breakdown is a breakout to the downside. 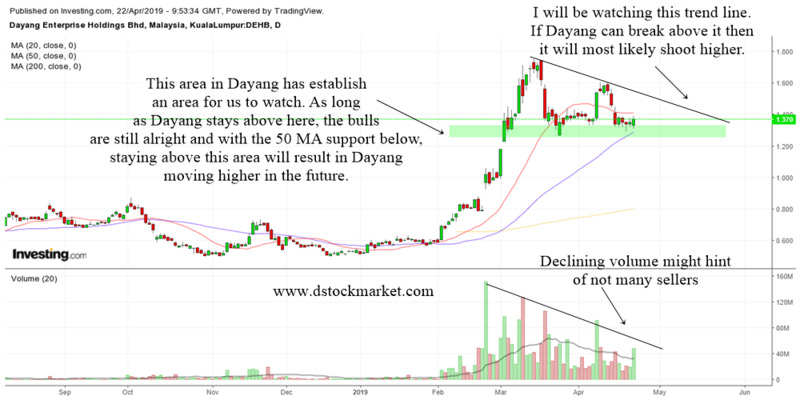 The stock trades sideways for awhile but it is unable to garner the strength to move higher. When that happens, it signals an internal weakness in the stock. It is like a weightlifter who tries and tries to keep the weights up but is unable to do so. When the pressure is too much, he sends the weight crashing down on the floor. Just as it is easier to make the weight go down than up, a stock falls 3 times easier than it rises. 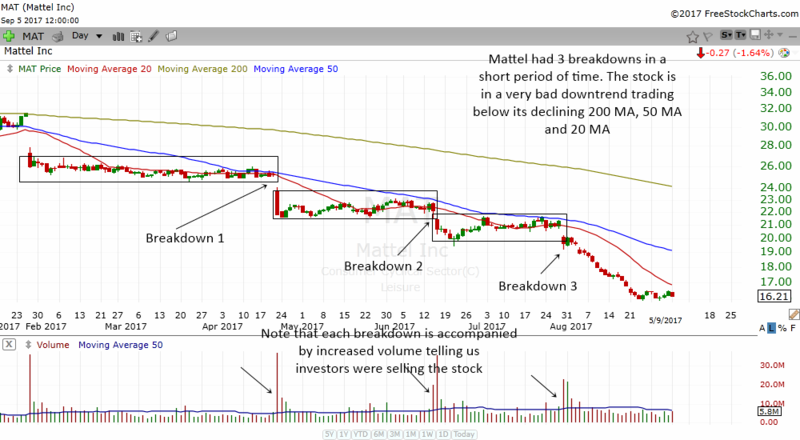 The diagram above shows how a stock breakdown looks like. The stock trades sideways for a period of time. Usually the consolidation is preceded by a downward move. 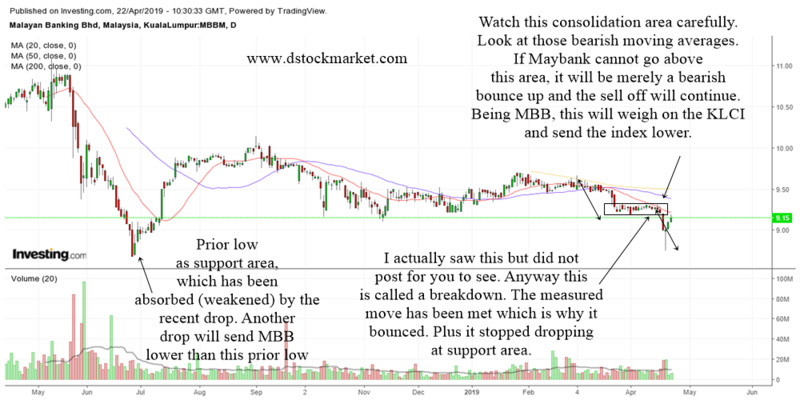 The stock then breaks down when it trades below the low of the consolidation. 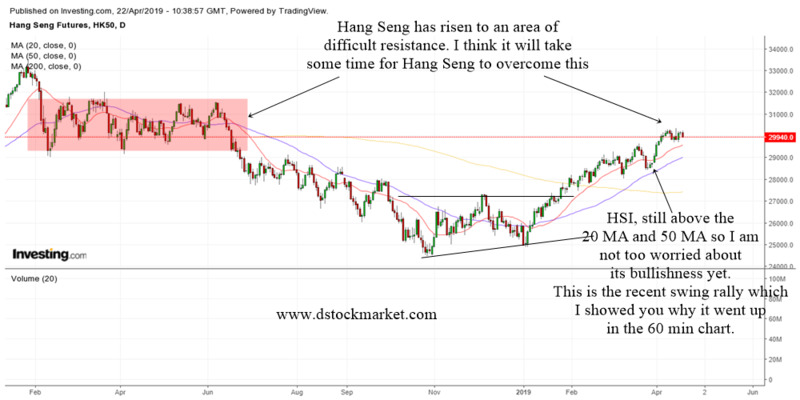 It is important to note that the stock needs to trade in a relatively tight manner rather than a wide and whippy movement. Otherwise, the sideways movement will just be a trading range. For a continuation pattern to the downside, the trading range should be tight so it produces the best breakdowns. With such a bearish technical, every consolidation can only be a continuation pattern to the downside. Notice that each time before the stock breaks down, there was a period of tight sideways movement. When it broke down, it was also accompanied by heavy volume which clearly tells us that the stock was sold off by investors who had no more faith in this stock. The trader can short the pattern the moment the stock trades below the low of the consolidation. You can put a stop loss at the top of the consolidation. 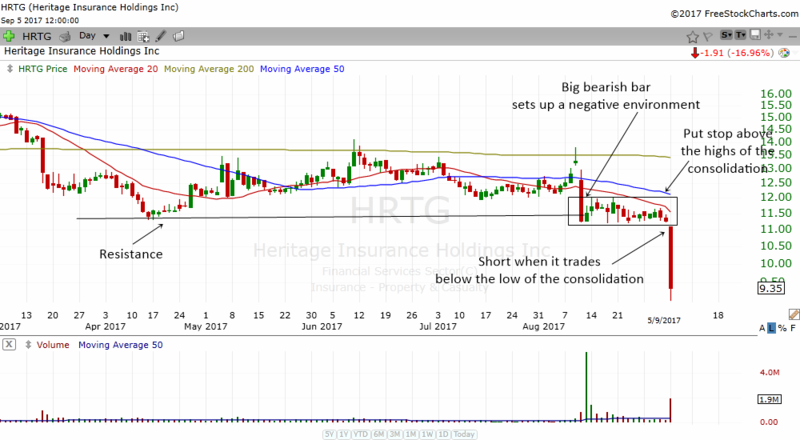 The chart above shows HRTG with a nice breakdown setup. Sometimes a stock can go down drastically in a single day and meet the trade target. Stocks tend to fall 3 times faster than it rises. So a trader can often make money faster by shorting stocks. HRTG had a nice consolidation that was below the 20 MA, 50 MA and 200 MA. Prior to the consolidation, the stock had a big red bearish bar which set the pattern up. As the stock consolidated, the volume dried up. This indicated a possible continuation in the downward move. 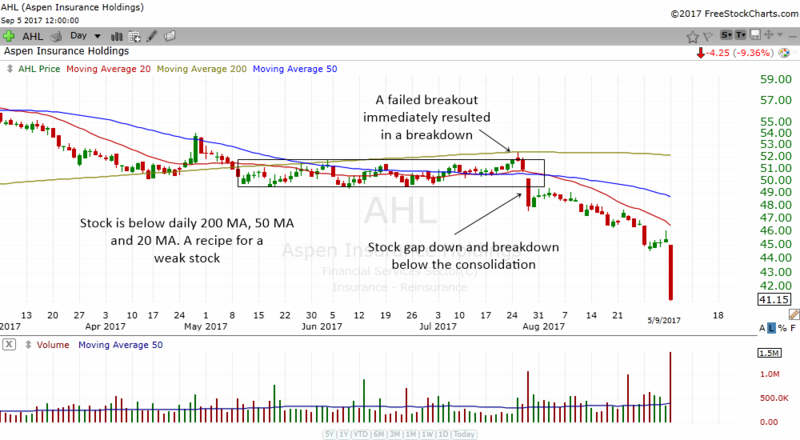 AHL also had a nice stock breakdown pattern. This stock took a bit longer to breakdown but the pattern is still valid. There are some interesting movement in AHL. The stock actually tried to break higher but the breakout immediately failed and the next thing you know the stock gapped down. A failed expectation in a stock can often cause a big fall in stocks. The gap down pushed the stock below the lows of the consolidation and traders came in to short the stock. 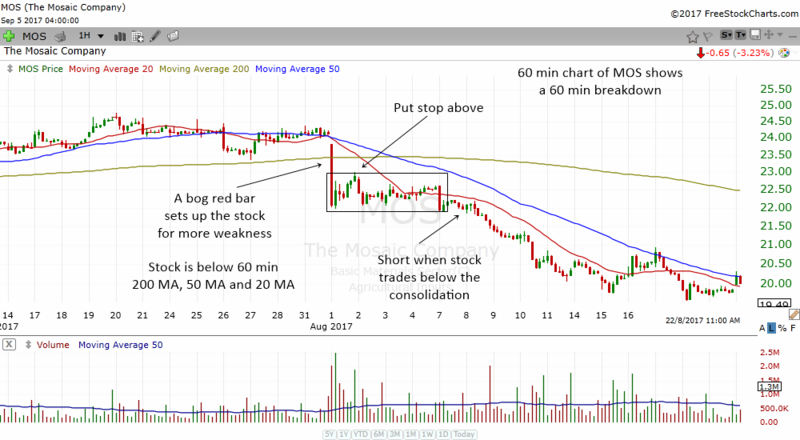 Stock breakdowns can also happen in lower timeframes such as the 60 min chart. In the example above, we can see how MOS setup a nice breakdown pattern. The stock went below its 60 min 200 MA, 50 MA and 20 MA. A big red bar prior to the pattern set up a weak situation for the stock. The stock traded sideways for awhile but then the selling pressure was so great that it break below the pattern and started a nice downward move. The short term trader can short the stock once it breaks below the low of the consolidation. A stop loss can be put at the top of the consolidation. One of the reasons why we want to select stocks that are below the 200 MA, 50 MA and 20 MA is because we want to trade with the trend. When stocks are below those MAs, it signifies weakness and a downtrend. We short stocks that are starting a downtrend and thus ensure that the odds are in our favor. The chart above is the 60 min chart of the Dow Futures. Notice how the index dropped below the 60 min 20 MA and 50 MA. It was actually forming an ascending triangle but the failure of the pattern caused the breakdown. 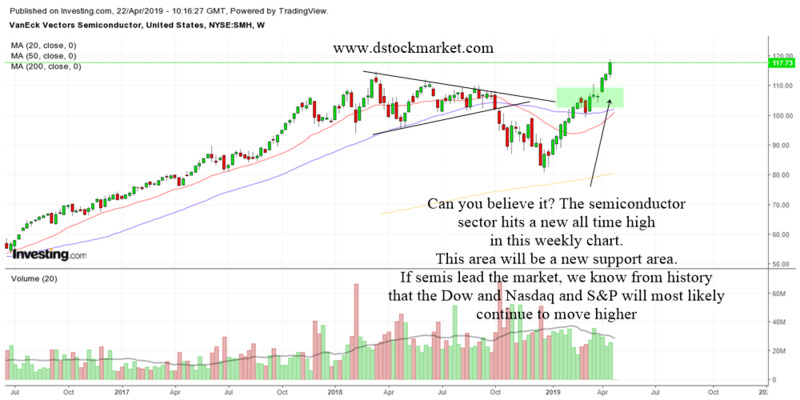 The moment the index drop below the consolidation area, a huge wave of selling happened in the stock market. 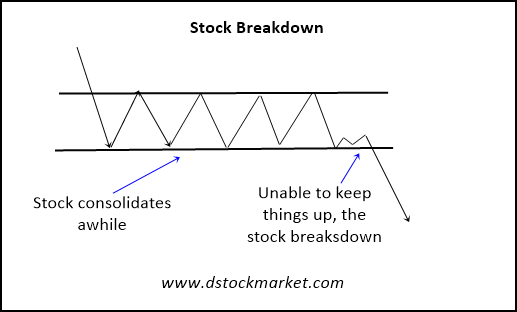 The stock breakdown chart pattern often appears in stocks and indexes. When a stock that is below its 20 MA, 50 MA and 200 MA starts to consolidate, be aware of a breakdown in the stock. 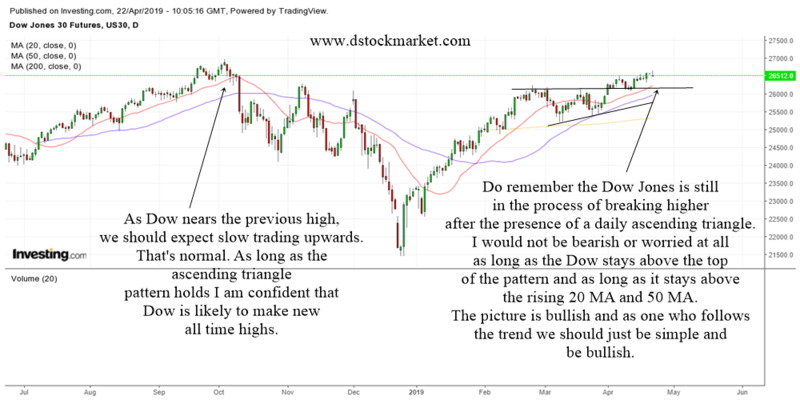 Its always a good idea to put an alarm at the low of the consolidation so you are always prepared to short the stock and profit from this chart pattern.